This, the third church on the site, is 500 years old, with 20th century additions. Bradford's most ancient place of worship is friendly, peaceful and fascinating, with many special features. The Cathedral is home to some of William Morris' earliest stained glass. There is bronze and embroidery designed by Ernest Sichel. Sculpture by Flaxman, Alan Collins and John Shaw, and windows and woodcarvings delight the eye, as well as art exhibitions and events in the Cathedral. Guided tours, and reflective pilgrim tours can be booked ahead, and the Cathedral offers an exiciting programme for schools and colleges. Bradford was the birthplace of Delius, and is still a place of music. The music of many cultures and traditions express the vitality of this immensely varied city. The Cathedral has a fine tradition of music, with a rich heritage of choral and organ music to explore and enjoy in a regular pattern of services and organ recitals. It is also a wonderful venue for chamber concerts, including an annual series during Autumn and Winter. 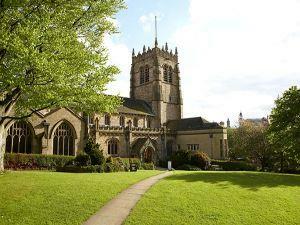 Bradford's ancient parish church is a civic church, and a diocesan cathedral. Throughout the year there are many services which are colourful and interesting to the visitor, as they reflect local or national life, or the festivals of the Christian Year. All are welcome. Details from the Cathedral Office, (tel: 01274 777720) or email secretary@cathedral.bradford.anglican.org. The Cathedral is usually open Monday to Saturday from 09.00 until 16:30 and Sundays 11:30 - 16:00, closed Bank Holidays. If you are making a special journey to visit the Cathedral please call first as occasional events or special services, such as weddings or funerals, may prevent or hinder access.